More pictures than any are likely to want to see. Acoustic isolation is all I have been able to give attention to, so far. For that, most products come from the home hardware stores, with the exception of the RC8. Auralex is its source. As there are two walls which contact the rest of the house, the effort was focused upon them. Neither touches the other, or the floor, but for a bead of silicone caulk. 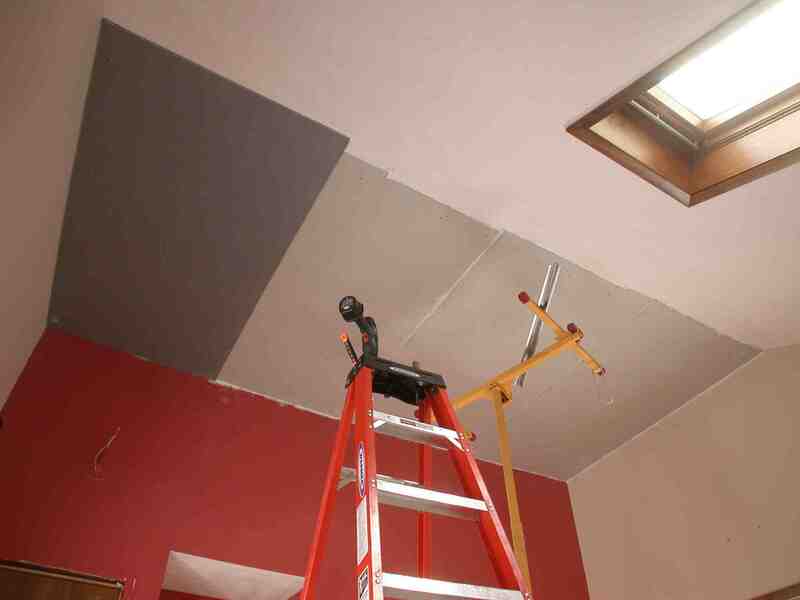 The idea is to dampen all the vibration before it leaves the room. "Decoupling" is another way of putting it. The results, I can attest, are indeed significant. This stuff is ugly, I know. 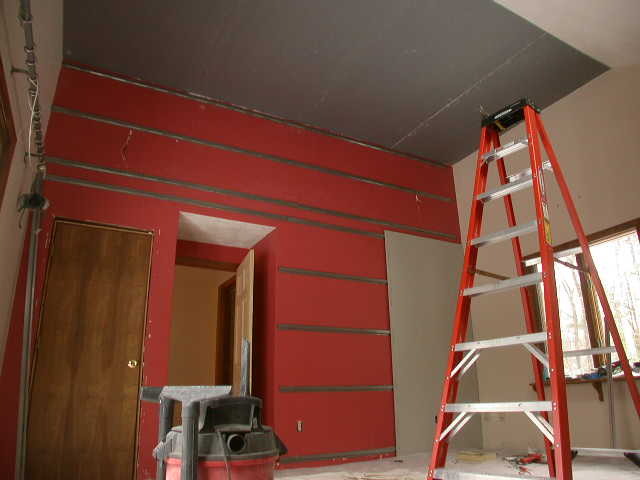 At least the colors matched up OK with the walls. 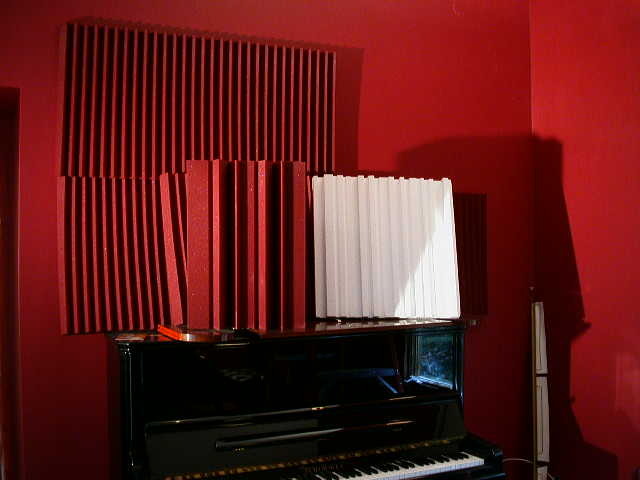 The triangular bass traps do help a lot without over deadening. The sound field opens up as the bass looses that boomy edge that the reflections give it. No kidding. I think ts going to take more coverage with the white diffusor for it to do its job. One piece doesn't really do anything but give ideas on how to hide it. Above, you can see the small piece of C channel metal furing I left atop the drywall jack. 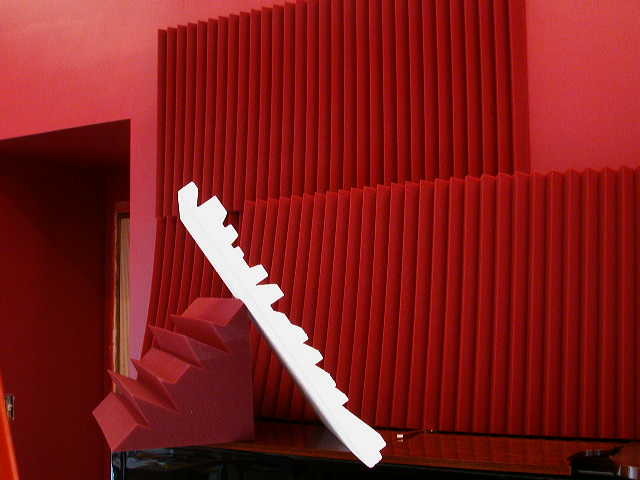 It has acoustic isolating properties all its own. 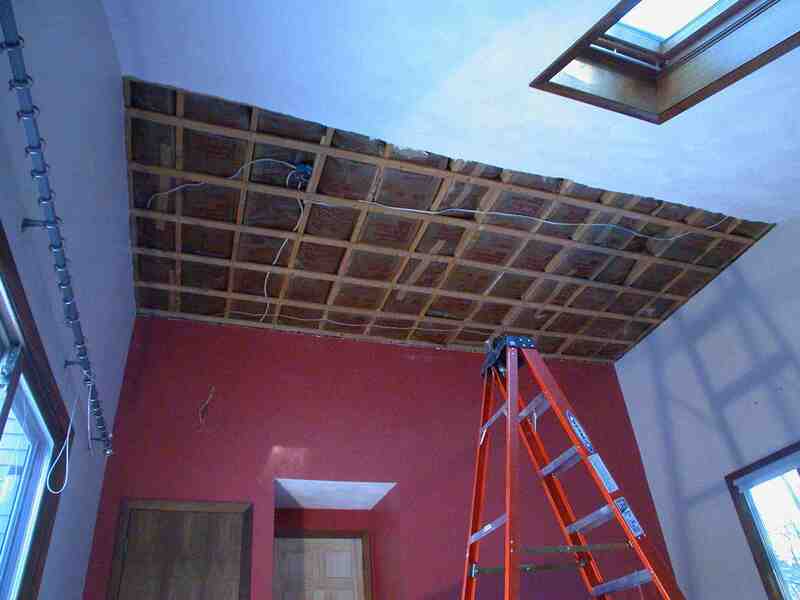 Suspended beneath it, for the ceiling, was a layer of 5/8 drywall followed by another layer of 3/8. Tricky picture here from above the high part of the ceiling. Its actually triangulated and hollow up in this spot, but opens up into the general attic, which is only half-inch drywall and some fiberglass away from every room in the upstairs. What you see is first a layer of celotex SoundStop followed by 3/4 crushed particle subflooring. Nothing goes on this unused space. 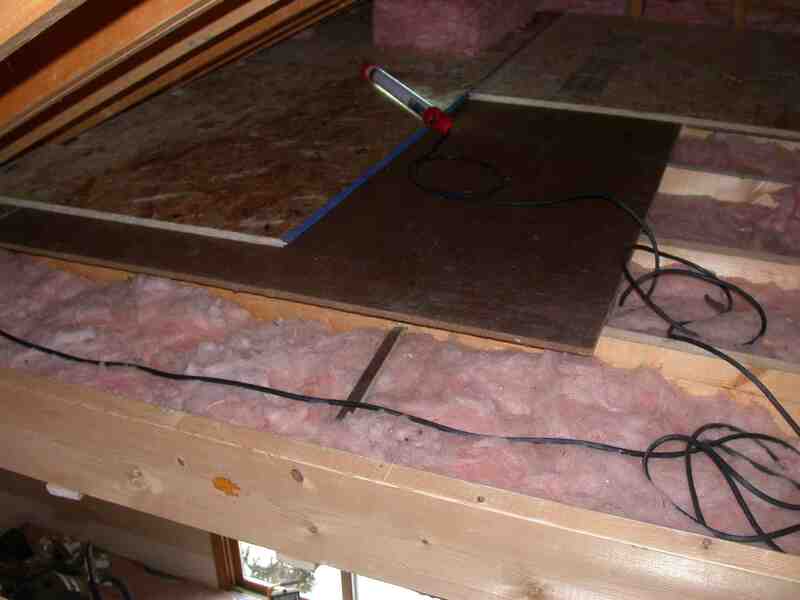 The opposite side of the joist features the aformentioned metal furring and two layers of drywall. At the bottom of the pic you can see the room below. This is a forced air home ventilation system. Pictured are two whole-house alternatives to humidifying dry indoor air. They are both designed by a company named Skuttle Incorporated. This name has come up on the forum as the one chosen by Chris Finger, a high-end piano retailer out west. They also coincidentally were the chosen manufacturer of our heating oil company. The reason you see two is because the evaporative one, pictured in the middle, was found not to be sufficient to bring relative humidity over 26-28% in our 25,000 cubic ft (2800 sq) home. While it was rated for this capacity, the reality behind many evaporative units is that they can no longer deliver the moisture they were once capable of when heating systems were less efficient and ran more often. 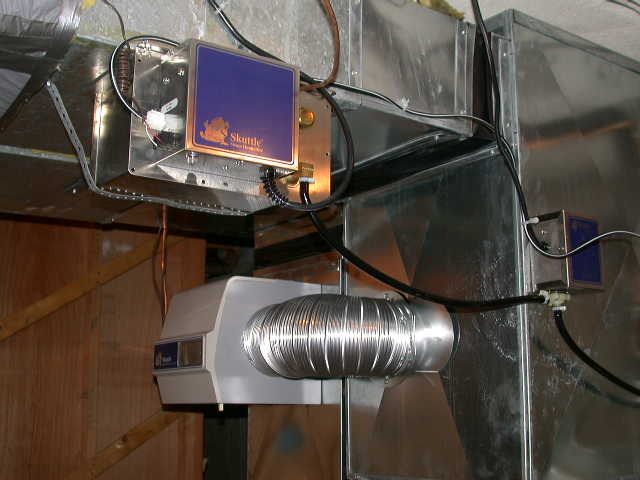 As a more modern heating system, with todays home construction and insulation methods, turns on the furnace less frequently, so too does an evaportive unit struggle to make use of warm, and to some extent cold, air to do its job. Steam really was the best answer and I must give a plug here for Skuttle, as upon hearing of what I was trying to do, they stepped up and delivered their 60-1 steam system *free* of charge. While jumping from evaporative to steam means choosing an approximate $900 alternative over a $400 one, what you get is a system that basically funtions on its own. When it's dry, it runs. It does not have to wait for the heat to come on. Instead, a 1500 watt heating element boils water, whose steam rises into the ducts. You can envision the first two inches, or so, of the unit pictured on the left being water that simmers before automatically turning on the furnace blower/fan. It never turns on the furnace. So, the up front costs of this straight forward, yet somewhat esoteric, set up are not that much more than a local system attached to a large grand. The benefits are also spread over many things and not just the piano. In fairness, one must also realise that electric bills will be higher with a system of this sort. Both the furnace blower and steam heating element consume considerable electric energy when operated for several hours each day.